Bring a pan of water to the boil, and add a generous pinch of salt. Stir in the rice, and cook for ten to twelve minutes. 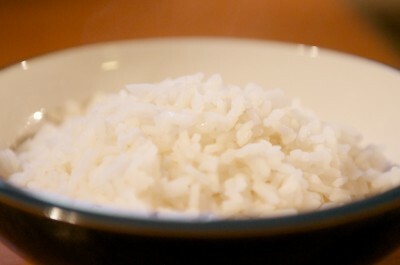 When cooked, the rice should be soft, but retain a little texture. Don’t overdo it — there’s nothing worse than soggy rice. When cooked, drain the rice, empty in to a serving dish and fluff it lightly with a fork. Plain boiled rice makes a great accompaniment to many dishes, or, you can do as we will do next — let it cool, and then we can turn it into something even better: Fried Rice. A word of caution: raw rice almost always carries spores of Bacillus cereus, which is a rather nasty little bacterium that can generate toxins that play havoc with your gastrointestinal system. It can withstand high temperatures, and so can still be present in cooked rice, even after boiling. Rice left at room temperature for a few hours can cause these spores to germinate and generate toxins. Always serve cooked rice promptly, and store any leftovers in the fridge where the low temperatures will slow bacterial growth. If you are serving a rice salad, then adding an acidic dressing such as lemon or lime juice, or vinegar will also help curb bacterial growth. 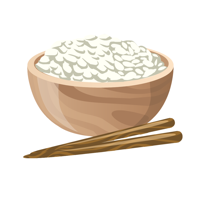 This entry was posted in Meals and tagged proper-rice, rice, salt by dopiaza. Bookmark the permalink.